Phagocytosis. Coloured scanning electron microgra- ph (SEM) of a macrophage white blood cell (brown) engulfing several Escherichia coli (E. coli) bacteria (pink rods). E. coli are normally present in vast numbers in the intestines of most mammals. They are not usually pathogenic in this situation. Under certain conditions, however, E. coli may be responsible for diarrhoea, enteritis and urinary tract infections. 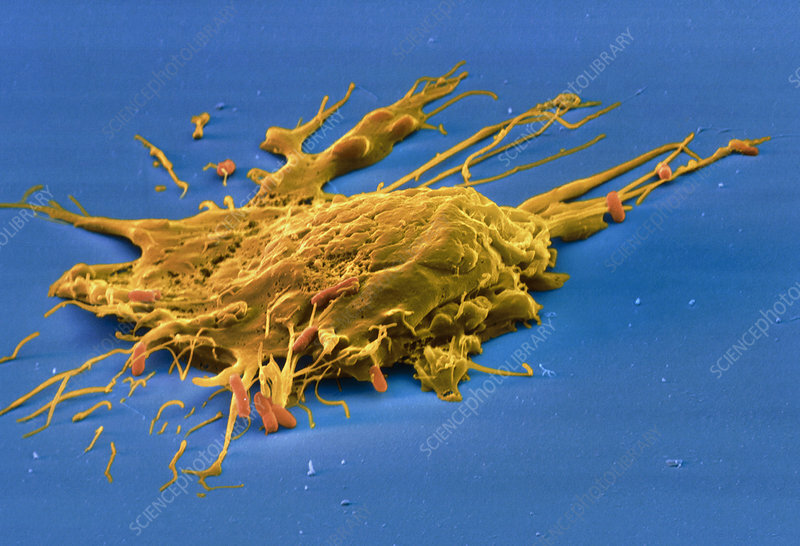 Here, the macrophage has extended parts of its body to surround and capture the E. coli bacteria. This process is called phagocytosis. Macrophages are part of the immune system that keep the body free of invading organisms. Magnification: x1,750 at 5x7cm size.